Home > Syrian uprising	> Syria’s rebels need to change strategy – and fast. Syria’s rebels need to change strategy – and fast. The Free Syrian Army, the military arm of the Syrian revolution, is in trouble. Its attempts to hold ground against Assad’s forces in Rastan, Homs, Zabadani, Deir az-Zour and Idlib have failed. Currently, the FSA is a loose umbrella group of at least eleven local militia groups operating across the country with various degrees of success. Only a minority of its fighters are army defectors; the majority are civilians, albeit those who may have received basic military training during compulsory national service. They are organized locally and armed with nothing more sophisticated than AK-47 assault rifles, RPGs, and PK machine guns. Lack of sophisticated hardware, effective leadership and nation-wide co-ordination, has meant that the FSA has had to retreat in the face of overwhelming firepower from ground and air by an enemy which is well-trained and cohesive. The prospect of NATO military intervention that saved the Libyan rebels, appears slim. Recent reverses call for a shake-up in the way the Free Syrian Army (FSA) has approached the war with Assad. It needs to stop believing its own propaganda and be more realistic about its own capabilities and those of the enemy. It should operate on the assumption that there will no foreign military intervention and it should plan for a long guerrilla insurgency that builds on its own strengths and the enemy’s weakness. Strategic re-think: The long war. In early June 2011 armed clashes between locals and the shabiha militia in the town of Jisr Al-Shughur in Idlib province precipitated a defection by the Syrian army’s Lt. Colonel Hussein Harmoush and around 30 of his men. Harmoush later fled to Turkey and announced the formation of the Free Officer’s Brigade (the precursor to the FSA) with the military objective of protecting civilian demonstrations against Assad’s murderous forces and, ironically, declaring that it was firmly committed to the peaceful nature of the revolution. This was politically-correct; the revolution needed to appear non-violent to attract international solidarity and quash regime claims of “armed bands”. In militarily terms however, it made no sense at all. The FSA developed its strategy on the notion that it needed to protect civilians protesting peacefully. This involved holding ground: manning barricades and fortified positions to physically stop Assad’s forces entering an area. The battle of Rastan was the first test for this strategy. 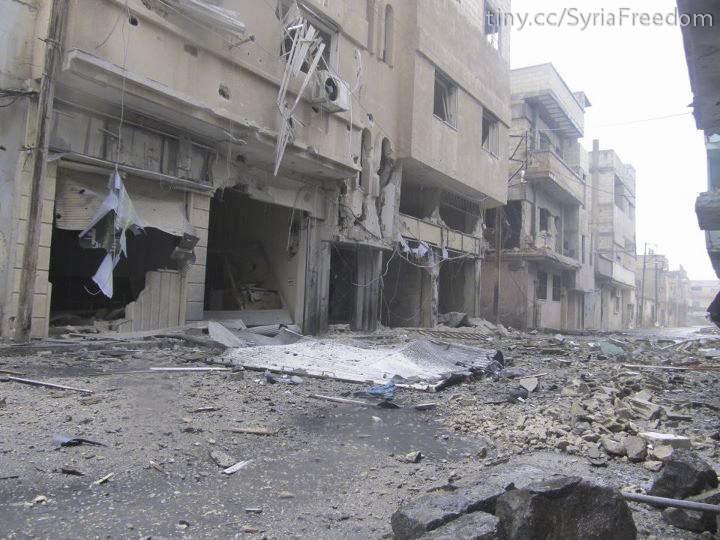 FSA fighters had taken control of the town in mid-September 2011 and made a very public show of defiance. The regime responded by launching a full-scale assault on the town, and within one week, the FSA withdrew after suffering heavy losses. The same story was repeated in January 2012 in Madaya and Zabadani, two towns 40kms from Damascus that had been declared “liberated” by activists on the Internet but which fell after only five days of fighting. Ditto Baba Amr, Duma, Idlib, and most recently, Deir az-Zour. Damage to homes in Baba Amr. Pitched battles have always resulted in reverses for the FSA. At present, the FSA is not only incapable of holding ground, its repeated attempts to do so risk losing it the support of the civilian population. Regime forces have little compunction about shelling residential areas where the FSA are holed up, and it means that more, rather than fewer, civilians die. In Baba Amr for instance, the entire residential neighborhood was shelled for two consecutive weeks in which hundreds of civilians have died and no building was left unscathed. Local community leaders in many areas are now exerted pressure on the FSA not to enter into pitched battles and only to operate in sparsely populated areas lest their town or district turns into a war zone. The FSA cannot risk losing local support. It must re-think its strategy in light of its inability to hold ground. War, as Carl von Clausewitz famously proclaimed, was a “a continuation of political commerce, a carrying out of the same by other means.” Although it remains a useful political slogan, claiming to protect civilian protests is no longer a viable policy. It is a limited objective in a total war. Instead, the FSA should declare an unequivocal political aim, which to my mind can only be to force Assad’s departure from power. Wars are often of two types: wars to achieve limited aims, or wars to render the enemy politically helpless or militarily impotent. In the case of Syria, the brutal and uncompromising nature of the enemy means that the FSA must fight the latter. Only by degrading Assad’s war machine will he be forced to step down, or else like Gaddafi, be forced to flee the capital. Given the FSA’s logistical problems and organizational challenges, capturing Damascus should remain a long-term objective. In the short-term, the FSA’s military objective should be: to cause sufficient loss of men and material so as to accelerate the fragmentation of Assad’s forces. The regular Syrian army, made up largely of Sunni conscripts, has no stomach to fight its own people. Many will defect, and many others will co-operate clandestinely with the FSA, passing on arms and vital intelligence. Assad has been forced to commit his most loyal units (invariably always Alawite) in some of the hardest fighting, and their effectiveness can be blunted by a well-executed guerrilla warfare campaign. For this to be achieved, the FSA should avoid pitched battles and adopt guerrilla warfare tactics that a- maximizes enemy losses while keeping its own losses to a minimum b- makes efficient use of limited resources. IEDs (like in YouTube video above), anti-tank missiles, mortars and sniper rifles should be the weapons of choice. The emphasis should be on a statistical strategy for victory; there are only a limited number of loyal army units and a war of attrition would destroy them. The FSA is a loosely-knit militia organization that needs to start thinking and acting like a cohesive guerrilla army. There are positive indications that certain talented field commanders are beginning to change their tactics and organization following the fall of Baba Amr. Much will depend on the Syrian National Council (SNC) and what financial assistance it can extend to the rebels. Much also will depend on the FSA leadership in Turkey, which can offer local “brigades” strategic vision and direction. For Syria’s armed rebels, its a case of adapt or die. For more on the FSA, this recent article by Jeffrey White paints an optimistic picture, while this study by Joseph Holliday is perhaps the best researched study on Syria’s armed opposition, although some of the information is dated. Is this article advocating a terrorist stratagy? Reads like it to me. Ian, If you’re pro-Assad, then this article is advocating “terrorist stratagy”, yes. Partisan, guerilla or terrorist could be just the same in many cases, it’s matter of viewpoint. I agree with most part of the article, but the revolution needs some fix points where the FSA still must hold ground, mostly in Homs and Hama + the surroundings. There are some possiblities what rebels didn’t use so far: they (or even ‘civilian’ supporters) could make fertilizer-based ANFO bombs and destroy Assad’s vehicles or even infrastructural elements, like road sections, bridges or electric poles. People also could place big stones or put earth piles on roads leading to beseiged cities to impede the traffic on Assad troops’ supply lines. Especially important to cut off public utilities of military barracks and facilities to make an increasing number of deserters. Your revised strategy is sound militarily, but politically it will radically shift outside views, the shift is one from protecting dissenting civillians to a traditional insurgency – the latter is always fought by a minority with unpredictable outbursts of violence. Then the state can more easily turn the use of IEDs – the weapon of choice of NATO enemies in Iraq, & a western bogeyman – into propaganda. Such a shift might be neccesary, but if it drags on indefinitely external support will fade. It’s a good post you wrote.